The Stadler Citylink Metro Vehicles in the KeolisAmey document. look very similar to Sheffield Supertram‘s Class 399 tram-trains, that are providing a tram service in Sheffield and will soon be running on the heavy rail network to Rotherham. The Citylink vehicles seat 88 with 150 standees. They can run using 750 VDC or 25 KVAC overhead electrification. The tram-trains are built by Stadler in Spain. 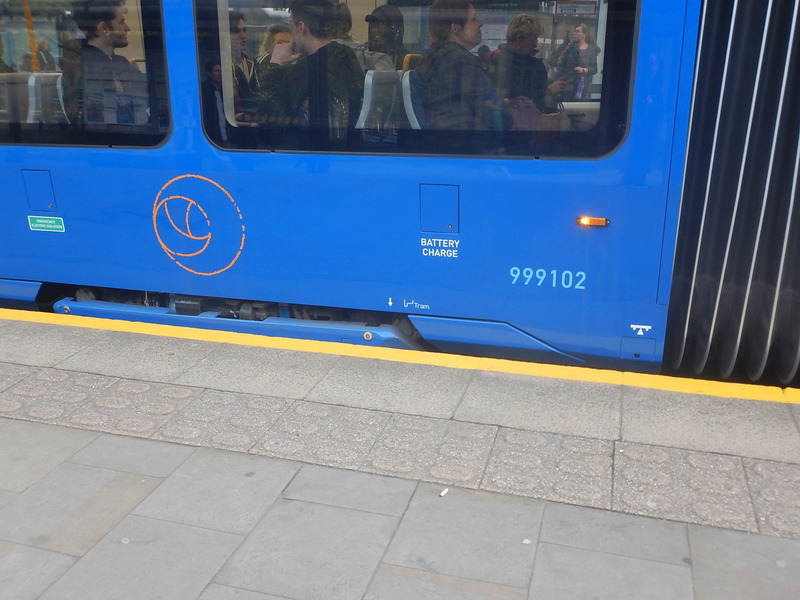 According to a driver, that I spoke to in Sheffield, the tram-trains have a good hill climbing capability. These pictures were taken of one of the Class 399 tram-trains operating in Sheffield. The Keolis/Amey document gives more details on the tram-trains. Main power source 25kV overhead line but also operates from battery. Capacity of 257 with seats for 129. Capable of on-street line-of-sight ‘tramway’ operation. I’ve known for some time, that Class 399 tram/trains had a battery. but I thought it was probably for secondary purposes, like making sure the vehicle crossed the boundary, where the two voltages change. So it looks like in Cardiff, battery power will be used for traction. Consider a Class 399 tram/train, working to and from Merthyr Tydfil. Rhymney has an altitude of 178 metres. This means that the train has a potential energy of 41 kWh at Merthyr Tydfil station. On the way down the hill from Merthyr Tydfil the regenerative braking will convert this potential energy into electricity, which will be stored in the battery. I would reckon that a battery of about 50 kWh would be an ideal size, but would it be big enough to take the Stadler Citylink Metro Vehicles from Cardiff Queen Street station to The Flourish and back? That journey is probably about 1.5 miles each way. How Far Would A Full 50 kWh Battery Take A Stadler Citylink Metro Vehicle? This would mean that a 50 kWh battery would take a three-car Stadler Citylink Metro Vehicle up to five miles, if the usage of the lighter-weight tram-train was at the lower end of the quoted range. The battery would certainly take a Stadler Citylink Metro Vehicle from Cardiff Queen Street station to The Flourish and back. As with the Tri-Mode Stadler Flirts, the Stadler Citylink Metro Vehicle with a battery, looks a very interesting concept. Most of the energy is provided by the 25 KVAC electrification, which would power the tram-train up the hill. Coming down the hill, the battery would be recharged using the regenerative braking. Battery power would used to take the tram-train on routes without electrification to The Flourish station.